With a variety of reports to choose from, Kyozou makes it a breeze to keep track of your e-commerce sales and inventory. 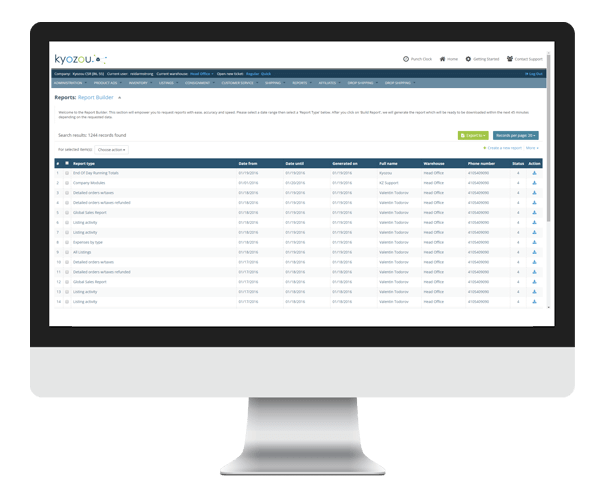 Inventory management is made easy with Kyozou’s instant updates so you can stay on top of inventory when you need to order more or see what your profits were for any specified date range. Reports are essential for any successful sales business. With Kyozou you can generate inventory manifests to get a real time accurate break down of your inventory. Need to compile sales reports to see what an item sold for? What listing fees were associated with a sale and how much did an item cost? Sales report help keep prices competitive. You can also schedule daily reports as a pick list for your shipping processes. Can’t find the report you need? Not a problem. Kyozou can customize a report from scratch.